There is a lot to talk about on the Lumberjack SCMS305DB sliding mitre saw. 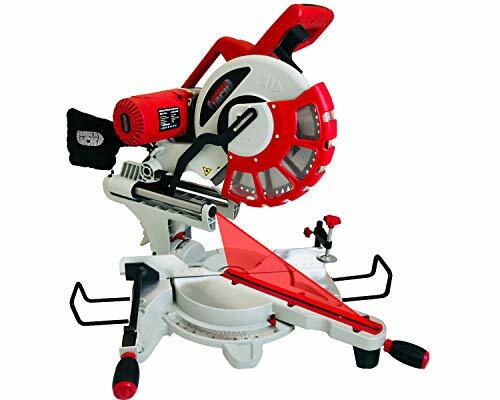 It is not often that we come across a mitre saw that is capable of such large cuts for this sort of money. It also has some professional features that you wouldn’t expect to see at this price point. Design wise it is pretty basic and is set up to do the job it was built for. It is not going to make your workshop look as good as a Bosch or Dewalt but this is not an issue for most of us. Well kitted out with some serious features, below we go through some to consider. For just over £200 you are going to struggle to beat this model on cutting capacity. With the maximum cut size of 340mm (13.3 inches) by 104mm (4 inches) the SCMS305DB is going to sail through 8 x 4 beams with no problem. This makes this model capable of a lot more structural work than some of the smaller models that will cut 2 x 4 timbers for smaller jobs but would struggle with structural work. With such a large cutting capacity it is important that the motor is man enough to cope with these large materials. It also needs to be able to perform these cuts for many years. The 2000 watt motor is more than capable of handling these challenges. At this price point I would expect to see a motor of around 1500 watts so this is a real bonus on this model. The motor is powered by a 230 volt power supply. It would be nice to see it in 110 volts as well for the site carpenters out there. Well this is not the sort of saw you want to be lugging around too much as it weighs in at 23kg. I don’t really see this a being designed to be particularly portable. 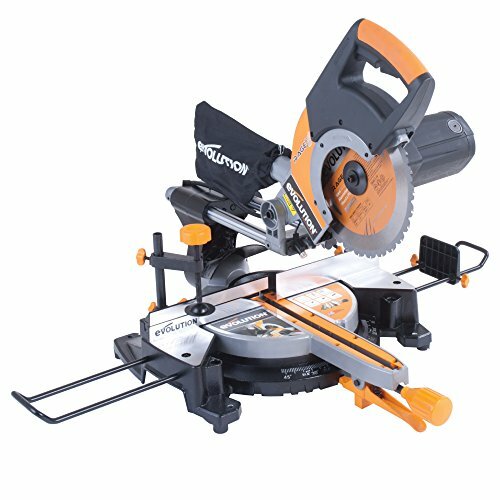 Most of the saws that weigh around the 10 to 15 kilo mark are not capable of the cutting capacity that the Lumberjack SCMS305DB is. Again a feature seen on the more expensive models. The double bevel angle mean you can cut 45 degrees to the left and right with ease. Really handy for making lots of fast cuts that are different angles. 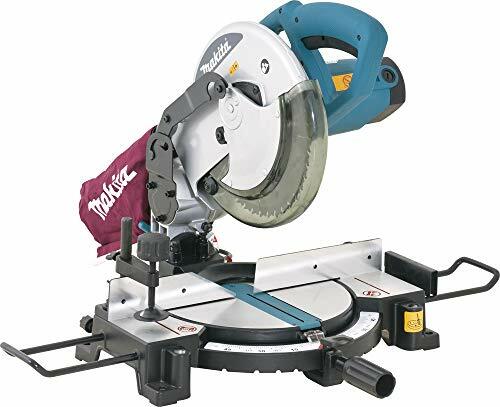 Definitely one for the tradesmen to think about as it makes the saw much quicker to use for jobs such as coving and architraves. If you need to cut trenches in your timber then the adjustable cut height is very handy. Easy to set for fast use, a standard feature but worth mentioning. For good cutting accuracy the twin lasers allow you to line up the cuts very easily. Most saws at this cost will only have a single laser or no laser. This handy if you are cutting large timbers that are hard to handle and move. Getting them lined up accurately is very important. The Lumberjack SCMS305DB 230 volt comes with a 305mm 30 tooth blade to handle some big cuts. This is not going to give you the finest cut but it will be easy to get a fine cut blade with a bore size of 30mm. The 2000w motor spins the blade at 4,500rpm. 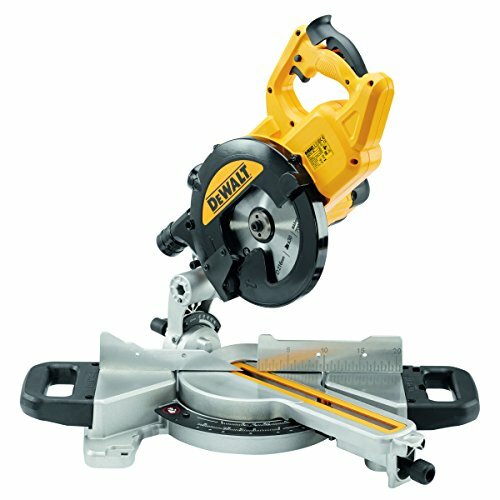 This saw comes with bar extensions to support the larger materials and a robust blade to cover for safety. This is important as the saws get harder to handle when cutting big 8 x 4’s. There is a dust bag included but to be honest for heavy use I don’t think it will help a great deal. Lumberjack is a fairly new brand in the power tool market so it doesn’t have the reputation that some of the bigger brands have. They do have a number of very happy customers so we thought it would be good to pass on some of there views as well. Many happy customers with the shear power and accuracy of the saw out of the box. Basically, it does what it says it will do which is a lot for the money! Set up is not that quick as a few people have needed to calibrate the laser before they can use the saw. Unfortunately, this will need to be done with a lot of saws with lasers. It is a bit noisy. This is down to the larger motor than some of the less powered models. The more powerful saws will make more noise. 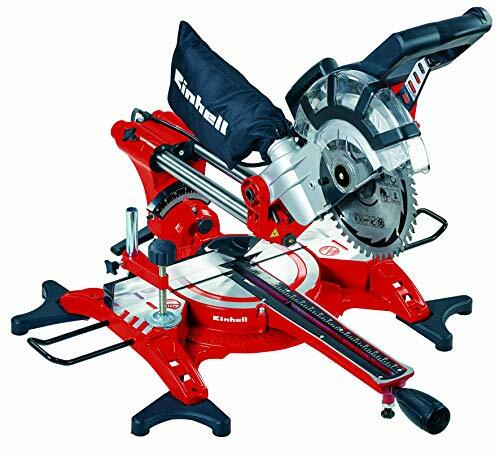 Well, this is not the saw to buy if you want a small easy to store mitre saw for the odd house hold job. It is a big unit that is capable of some serious jobs. 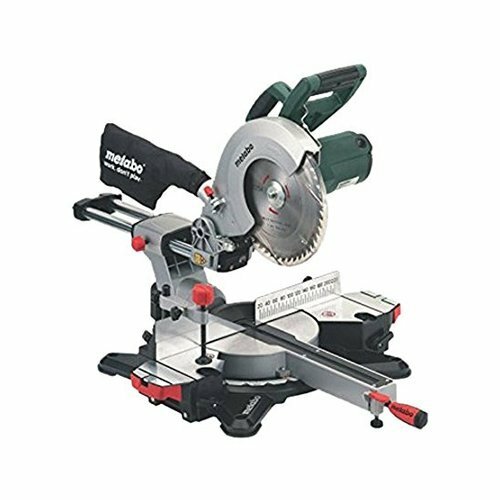 However, if you are after something that will tackle most jobs around the house including building an extension then we highly recommend the Lumberjack SCMS305DB. This model leads the market in value for money with this sort of cutting capability. If you think you really will need to cut structural timber, large planks or big lengths of hard wood then look now further. Highly recommended.